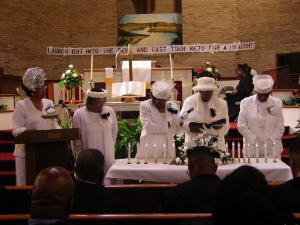 The first Missionary Circle that was instituted in the Western Assembly was at Thaddeus Chapel Disciple Church in 1925. The first president was Mrs. Jennie Allen, Vice President - Mrs. Sarah Bethune, Secretary - Mrs. Bessie Kelly, Field Worker - Mrs. Pearlie Bowser McAllister. Rev. E. J. Flannigan, Pastor of Thaddeus played a great part in instituting the missionary circle. After working at home for two years, a delegation of women were permitted to attend the General Conference at Piney Green Disciple Church, November 1927. Rev. J.W. Raynor, Chief of the Assembly who did not believe in the women having a place in the church granted them the privilege of organizing themselves. Other churches throughout the Assembly began organizing.